Sterling Silver Necklace and Pendant Set. 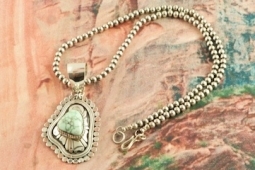 Genuine Campitos Turquoise set in Sterling Silver Pendant with Sterling Silver Necklace. 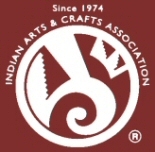 Created by Navajo Artist M. B. Signed by the artist. Mined in Mexico from the Pino Chueco and Cananea mines in Sonora, Campitos Turquoise was mined extensively in ancient times, with evidence of trade with Native American peoples. The Toltecs and Aztecs left much evidence of the importance of turquoise to these cultures. Necklace is 18" long x 1/8" wide. Pendant is 2 1/2" long including bale x 1 1/4" wide.